Some of you will have heard of the little parish in Normandy, France; a small village with a Catholic church blessed with a vibrant Catholic community led by a brave, authentically Catholic priest, loyal to the Pontiff and to Summorum Pontificum. The Abbe’ Michel celebrates the Tridentine Mass, and his undiluted Catholic message has great success; ergo, he must be removed lest the bankruptcy of the post V-II ideology be exposed in front of the french Catholic world. Therefore, the rainbow-clothed, sixty-eighter Bishop Nourrichard ( a man who has no problems with assisting to so-called women’s ordination, but has a problem with the Tridentine Mass) removes the priest from the church (I do not know the details, there might have been some skirmish; this is not uncommon and is actually the way you do such things as a liberal bishop) and has the effrontery of presenting himself in Thiberville to announce the removal. The small community openly confronts the bishop in a way certainly most inappropriate in front of the Tabernacle, but that shows all the love and support of this authentically Catholic community for their rare priest. The bishop is booed and the villagers openly show who, for them, is the real Catholic; the videos go around the world. The skirmish continues with the Abbe Michel refusing to vacate church and community pending the legal controversy. One year later, the decision has come and it is, as largely expected, in favour of the rainbow-clothed, sixty-eighter, disgraceful Bishop Nourrichard. Let me say that I assume that the Prelatura Apostolica was probably not in a position to decide otherwise and that my anger is not directed at them. This was probably a decision about competence, not opportunity; about the formal right to decide, not the factual quality of the decision. I do not think that many had expected a different outcome. Still, this decision hurts because, once again, it presents in front of our eyes a disgraceful bishop working against authentic Catholicism and getting away with it. Bishop Nourrichard has now successfully removed this living testimony of his own failure from his diocese. Unfortunately for him, he has not become a bit less of a disgrace for that. This man is a scandal and a shame far beyond his choice of shirts. Nourrichard was appointed to Evreux by Pope Benedict. If the Holy Father chooses jokes like this man as bishops, how can he hope that his reform will go on at more than snail pace? This is another clear sign that Pope Benedict’s appointment are, generally speaking, too far on the accommodating side and that this love of gradualism meant to appease the local hierarchies and tambourine mafias continues to damage the authentically Catholic faithful, and will do so for many years to come. I am eager to get more information about this and will, in case, report again in the future. I’d love to know what is the next destination of the Abbe’ Michel, what will the local community do (vote with their feet and desert the church en masse, very likely) and whether there will be further developments. 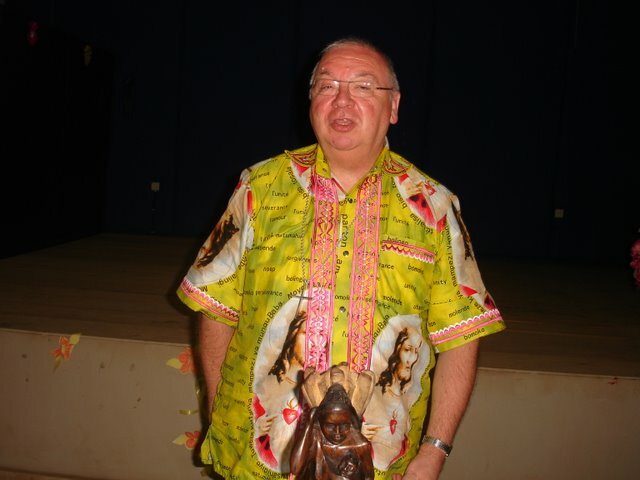 A good development would be the removal of Bishop Nourrichard and his transfer – without the control of a diocese – to some very cold, very hot, or mosquito-plagued place, where he might perhaps even have ample opportunity to show off his striking shirts. As for the good Abbe’, I wonder whether he will not follow the example of the excellent priest about whom I have blogged yesterday and join the home of serious Catholicism in France: the Society of St. Pius X. Posted on January 24, 2011, in Catholicism and tagged Bishop Nourrichard, Catholic, Catholicism, Conservative Catholic, Conservative Catolicism, SSPX, Thiberville. Bookmark the permalink. 9 Comments. This is a terrible outcome, but seemingly an inevitable one, as the bishop had exercised his authority within the law. Although Abbé Michel had rights as a parish priest not to be moved from his parish, the bishop simply pulled the rug from under his feet by the wily administrative measure of abolishing the parish. The scandal is that the one area of the diocese not part of the “desertification” of the Church is to lose their priest, the very man whose labours and example have helped this parish to flourish. Abbé Francis Michel has been responsible for 12 “clochers”, ie churches in the parish of Thiberville for 24 years. While Thiberville contains a very small percentage of the population of the diocese, recent figures showed that a very high percentage of the confirmations of the diocese have been in the parish. He also personally ran the catechism class himself. The bishop originally planned to send the Abbé to the other end of the diocese to be the chaplain to an old people’s home: he would no longer be a parish priest. I don’t know how the bishop plans to dispose of him now. Pray for him and for all the parishioners of Thiberville who are losing their shepherd. I fully agree, cecilia and it is difficult to see how the Signatura Apostolica could have decided differently without introducing the extraordinary principle that they can approve or reject a bishop’s decision according to its merits. The details you give about the diocese of Thiberville are astonishing and highly alarming. If you can direct me to direct sources I will look at it and in case write about that. Everything is in French, I’m afraid, and I haven’t time to search back and find everything. I have seen official tables from the diocesewhich I think were posted on the blog website Soutien a Monsiuer l’Abbe Michel (mentioned below) which shows how Thiberville stands out from the rest. •	Nommé par Mgr Gaillot dans ce groupement de paroisses aux marches du Calvados, le père Michel, alors jeune vicaire de la cathédrale d’Evreux, découvre des églises sinistrées qui menacent ruine. Il ne compte pas plus de 20 paroissiens le dimanche. L’hiver, faute de chauffage, il doit célébrer la messe dans la sacristie. Son «zèle» et «sa foi à déplacer les montagnes» parviennent à convaincre les municipalités de rouvrir et de restaurer leurs églises, au prix de lourds investissements pour de toutes petites communes, contre l’assurance qu’une messe au moins y serait célébrée chaque quinzaine dans l’un des 13 clochers du groupement interparoissial de Thiberville. Vingt ans plus tard, pas un maire ne regrette ce choix. Les églises sont combles. 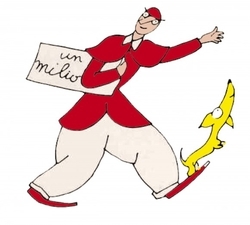 Les villages en profitent largement, qui vivent désormais au rythme des paroisses. Ce qui explique notamment que les élus locaux mènent la fronde. En première ligne. Maire pétitionnaire, Guy Paris est parvenu à rassembler 4 000 signatures pour le maintien du père Michel. Aujourd’hui, comme nous l’affirme Christian Wagner, un laïc, la paroisse de Thiberville est la plus dynamique du diocèse d’Evreux : 120 enfants sont catéchisés ; l’an passé, elle a eu 30 premières communions, 30 professions de foi, et près du quart des confirmations du diocèse (40 sur 170). «Pas mal, non, pour une simple communauté paroissiale paysanne ?» «Ne juge-t-on pas un arbre à ses fruits ?», s’étonne à son tour Jérôme Richard, un jeune père de famille. NB: 13 clochers, not 12 – elsewhere I have seen the figure of 14 clochers- and almost a quarter of confirmations of the diocese (40 out of 170).I have read that the parish group of Thiberville contains less than 1% of the population of the diocese. Wikipedia gives the 1999 figure for the population of the diocese of Evreux as 541, 054.
http://thiberville-soutien-abbe-michel.hautetfort.com/ I would suggest the author of this could point to original sources, even when he’s not already quoted them. The search function is the only way to track down old posts. The website of the diocese also has some figures. extremely useful info and I think I’ll use it to post again in the next days. Let’s face it: most bishops are effectively fifth columnists. In any secular corporation they’d have been sacked a long time ago. It begs belief that the Vatican hasn’t put down the hammer yet. Sadly Pope Benedict’s pontificate differs from that of his predecessor more in style than substance. I agree on the bishop, Shane. Simply not fit for purpose. As to Pope Benedict, I see a lot more substance in many other issues (liturgical renewal; abandonment of the media circus and search for the easy and popular position), but as far as bishops’ appointment is concerned I struggle to see a big improvement, though I must say here and then we have good choices. In my eyes, Benedict will appoint the most conservative candidate which in his eyes doesn’t cause discontent within the diocese. In rare cases he’ll force a bit the situation, but not often and in case of resistance he’ll soon backpedal (Wagner is a point in case). This was on French TV last January. It shows what happened immediately after the emptying out of the church at Thiberville. Two women of a certain age harangue the bishop. One plucks the sleeve of his rainbow chasuble “Why are you wearing that thing?” Less than an hour later the parishoners block the bishop’s entry to the next Mass at another church within the parish, being celebrated by Abbé Michel, by standing side by side at the church door, facing the altar, – so with their backs to the bishop. Now the bishop gets rid of the parish priest by suppressing the parish. Would it not be possible for the Holy Father to get rid of the bishop by suppressing the diocese?